International Journal of Research in Health Sciences,2016,4,1,11-14. Obstetrics & Gynecology Nursing Department, Institute of Nursing Education Byculla, Mumbai-08, INDIA. Introduction: Maintaining skin integrity is important clients at higher risk of developing pressure sores because of immobility, inadequate nutrition and older age. Studies done revealed that the incidence of pressure ulcer increases with length of stay. 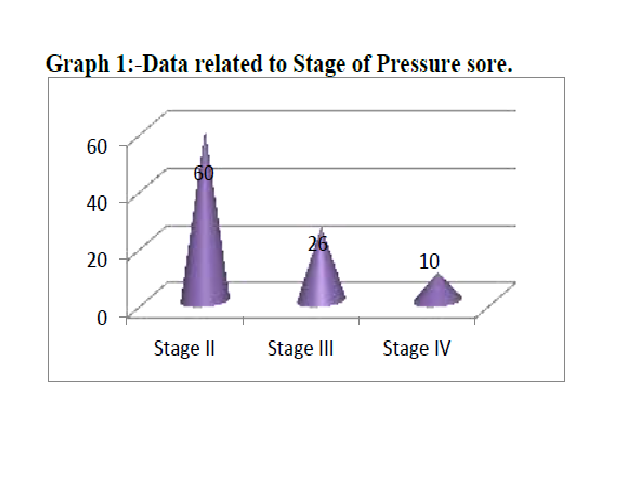 Hence a survey was conducted to know the prevalence of pressure ulcer and its impact on duration of hospitalization among hospitalized clients in public hospital. Material and Methods: A descriptive research survey approach was used to conduct study. Samples selected by non probability convenient sampling techniques and sample size was 200. According to the objectives a interview scheduled prepared and used. t. Tool consisted of data related to demographic characteristics and data of hospitalization the obtained data were analyzed by using descriptive and inferential statistics like frequency, percentage mean, SD and ‘ Chi Square ‘test. Result: Descriptive survey found that incidence of bed sore is more in male than female in the age group 41 to 60 years of age who were consuming mixed type of diet and had less body weight. And it is revealed that duration of hospitalization is more than 6 weeks and not able to carry out the daily activities and majority of samples were in stage II.